Pro Audio or Large Scale DJ systems?? Re: Pro Audio or Large Scale DJ systems?? Probably some of the above statements are true, but there are some DJs and some of what you guys call reggae DJs with properly configured mega rigs, light years ahead of what some might consider pro in the Lab lounge. What people here consider a pro sound system is the one that is loud enough, properly setup with a fairly linear frequency response and good coverage. None of the reggae system are like that. They are more like this. I think that may go right to the point in that "properly configured" infers that the system is properly configured for the specific application or situation. A properly configured system for one use may be quite inappropriate for another use. So it may be that in both cases the systems are properly configured for the requirements and expectations associated with their use but that does not mean they are properly configured for all applications. It's a lot tougher when you do both in the same night. I do quite a bit of that, most recently at a dual facility event here in Los Angeles. I find that one needs about +10dB up on the Subs for EDM, and that I don't really care about going down to 20Hz- the Chest thump is much higher- 80-120Hz. THe Low Mids are often ignored in a DJ setup in favor of Rumble & crap. Learning Yoru Crossover cold, Going Digitally controlled on it such as an Ashly 3.24c or higher helps- One can adjust by the band if neccessary. I find tha Aux Fed Subs can help, but cause a lot of confusion if someone isn't up on how to run it, which is why I generally stay away. Also Proper array of speakers helps a lot, and understanding coverages. In general it's the same gig as a Proper sound reinforcement job mixing bands. I don't see the need to argue semantics. I know what you mean regarding EDM sound vs. other sound. There is a difference, but it's not an either/or thing. Naturally there's crossover. 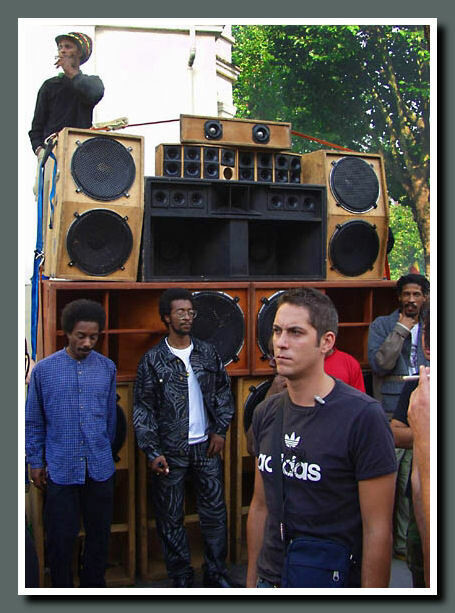 Reggae systems are cool because they're are so darn funky and visually imposing...they "look" loud. Of course they are not technically "the best", but it's a particular niche and style that is as much a part of the music as rasta dudes and joints. The roots of EDM systems come from this. The underground/warehouse/free party scene. Crews had systems with names. It IS about kinetic bass. The skills used to mix bands transfer to mixing for EDM DJs (and "live PA") But the emphasis is on the beat and bass, not guitars and vocals. It still has to sound good, and EDM sounds way better when you hear all the freqs clean and clear- yes the midbass is crucial too. But the overall EQ is is definitely with a significant rising slope going to the LEFT. for dj systems ppl need to realize that there is a lot more power needed. at least 70 % as theres more compresson on the signal. bass is a must and low mids should be cut completely. here in britain they like lots of sub bass but not much mids. we drive the dj mixer hard so it gives the most aggressive bassy sound. If you are going to cut the mids completely, it should be done from the DJ mixer and not system-wide lest the voice of the MC is muddled and you will be missing a lot of musical content as well. Every song is mastered (or not) differently. This is why most of the value of a DJ mixer is in the EQ on each channel. I agree there is a perceived sweet spot on most mixers and it is generally perceived by many as overdrive. I have toyed around with many different solutions including preamps, expensive multi-band compressors, processing units, and even BBE in an attempt to get that sweet spot sound without sending the main console operator a hotter than desired signal.